"How long can you survive on the lethal TOWER OF RUBBLE as it crumbles and rebuilds itself around you?" I'm working on a '2600 port of Tower of Rubble, a really fun casual indie game that was originally created for PC by Flatgub as an entry for the 2017 CGA Jam. Last year in 2018, the game was ported to the Commodore 64 and hopefully this year my port will be available for the Atari 2600 on an actual cartridge! The original creator Flatgub (Chloe) said to be honored to hear that I was making a port, how cool is that? The honor is all mine, by the way! Tower of Rubble is a simple, yet very addictive game, in which you control a little stick man that must survive on the 'Tower of Rubble' as long as possible. Blocks of pebble will fall from the sky every second at random positions, building up the tower. And at the same time laser beams will tear down the tower by clearing out full rows or columns of pebble. Also the outside walls will slowly disintegrate and sink into the sea. Sounds hectic? It is! But you have to keep calm and make the right decisions in a split second to stay alive. The music is synced with the pace of the falling pebble, which helps to raise your adrenaline levels! left & right is for running across the blocks and jumping off - note that ledges are 'auto grabbed' if you jump towards them. By using diagonal joystick positions, you can also combine some moves. Mastering the different kind of jumps is essential for survival on the tower. If you never played this game before, please first practice all possible moves on the title screen. Then press fire to start the actual game. Pushing the 'Reset' button at any time will take you back to the practice/title screen. After you have practiced the running, climbing and jumping on the title screen, you should be ready to go against the tower. 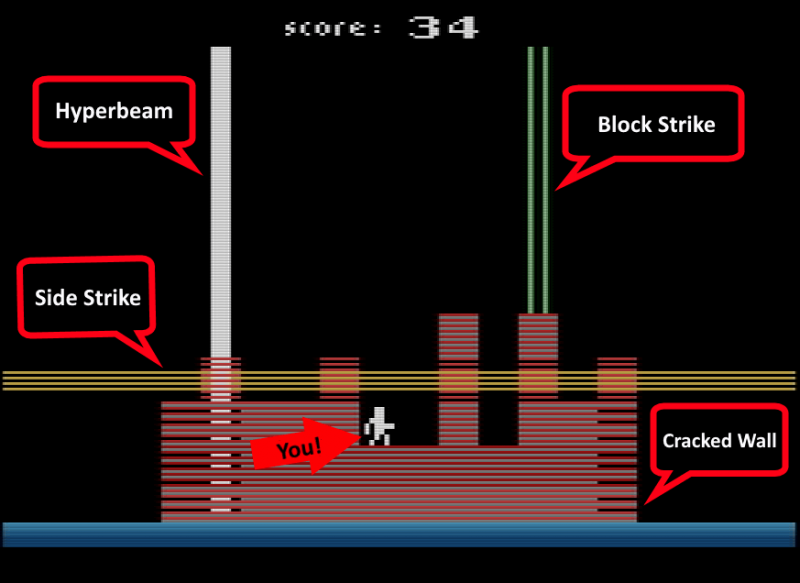 When the game starts, you will see two green converging laser beams that show you where the next block of pebble is going to land. Be sure to move away from that spot as quick as you can! Also, the outside walls will slowly disintegrate and sink into the sea. Hint: you'll need to perform a 'long wall jump' to cross the emerging gaps. 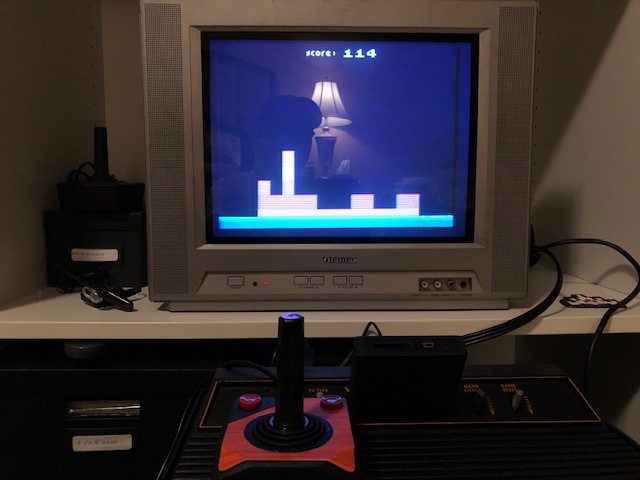 Because of its pixelated graphics, single screen and usage of straight lines, the original PC game lends itself very well to an Atari 2600 port. Of course I had to make a lot of concessions along the way, as you all know the '2600 has its limitations. My '2600 port of the game uses less than 128 bytes of RAM and 4K of ROM, but I managed to keep the same basic gameplay and smooth animation (30 frames/second) as the original game, without the use of any flickering - as I don't like sprite flicker in general. At this moment, the basic mechanics and key elements are there and the game is already very playable. The playfield is 16 blocks wide (compared to the 26 blocks of the PC game), which makes the Atari port a bit harder, but still very playable IMO. Porting the music was a tough job, as some notes just aren't available on the '2600. Two-voice polyphony solved some of the issues and also Paul Slocum's Music and Sound Programming Guide helped me a lot to get good results here. Keep (and display) the high score. Support SaveKey / AtariVox for keeping high scores. Note that there are still a lot of things on my to do list. I'm aiming for a late 2019 release. You can download the work-in-progress rom below for NTSC and PAL60. As always: feedback and suggestions are very welcome! Edited by Dionoid, Sun Apr 7, 2019 4:27 AM. This WIP is well worth the download even though there isn't any gameplay to speak of yet. There is such a variety of movements from block to block it's unbelievable and it will get you in good practiced form for when the blocks start falling! The smooth animation is something to behold for sure. A simultaneous two-player option might be something to consider? with two different colored players. The beam animation wouldn't be as detailed and have the color of something else but would still be cool! Maybe do the best one player game possible first and then an alternative two player rom, I would do both side by side tho, if it's even possible that is. use white players missile as the aim thing and change nusiz, then use the ball as the falling brick, horisontal ones could be done with bgcolor and changing pfcolor on the same lines right?? I want this port to be close to the original, so I'm targeting a single player game. But I agree this would also make a great 2-player game! My plan is to have player0 white (as it is now), and use player1 and missile1 to draw the vertical block-strike beams and hyper-beams in green, which looks better IMO. The side-strike beam is going to use bgcolor indeed. Sounds like it could be very cool! Best of luck! nice start, the character animation is superb, really fluid and smooth. Look forward to seeing how this progresses. 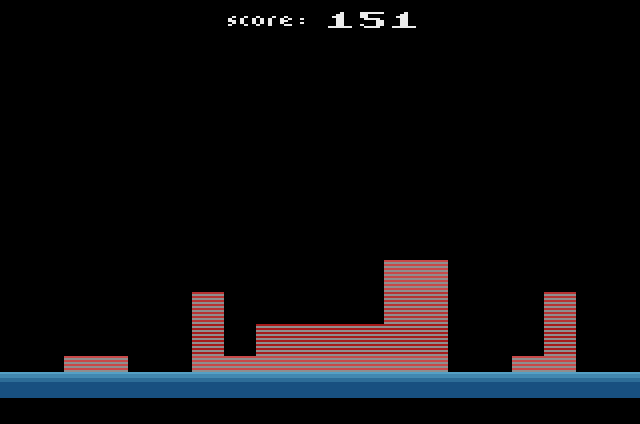 Hi, I've just uploaded the first playable version of my "Tower of Rubble" port for the '2600. Wow, this update is incredible and gets into some crazy action quickly! I love how you represented all the elements from the original game, everything works so well. I will definitely be featuring it on an upcoming episode of ZeroPage Homebrew, which returns Wednesday April 3, 2019! Wow mate this is a brilliant interpretation! You have really nailed the basics of the gameplay and presented it in a very Atari 2600 way with imaginative colors and rendering to remove blocks! Also love the music - great rendition! Look forward to the remainder of the game being finalised! Edited by mksmith, Sun Mar 24, 2019 6:44 PM. Edited by Nathan Strum, Mon Mar 25, 2019 2:53 AM. This reminds me a lot of a thing I used to draw as a kid on lined notebook paper- I always envisioned it as a side scrolling Indiana Jones style game. Perhaps I played this "Tower of Rubble" game and it just stuck in my head... I have no memory of the game though. That being said, this looks awesome and I want in! Fantastic port of the original game. Well done! 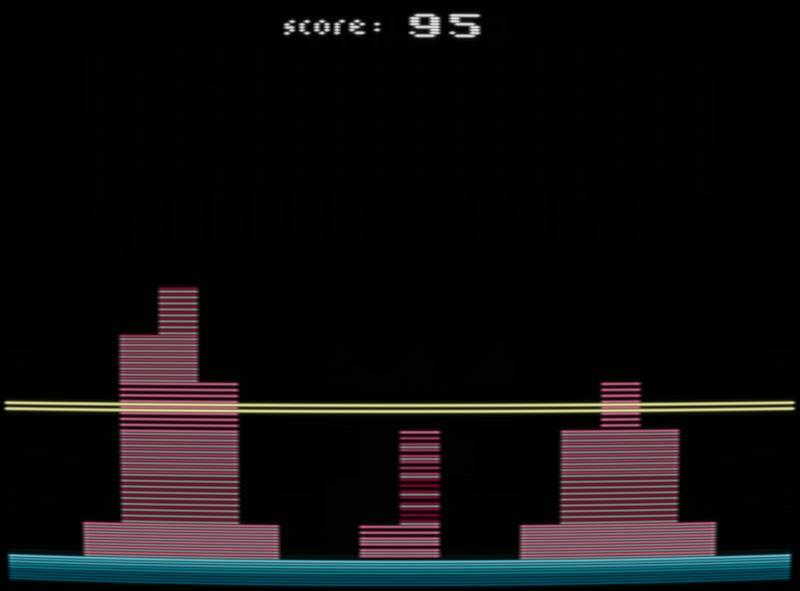 It seems to be difficult to consistently exceed 100, as the game likes to trap me on a small island in the center of the screen with a two block gap on each side and then it removes the entire island all at once. So cruel. Guess where I was before I jumped off. Edited by fluxit, Mon Mar 25, 2019 12:55 PM. Wow Very fun and addicting game! Can't stop trying for a better score. I apologize if this has been asked/answered, but any thoughts to a 2 player version? Yup, Lillapojkenpåön asked. Here's my best score so far. Don't know how Nathan achieved 151. Edited by sramirez2008, Wed Apr 3, 2019 8:20 PM. Don't stay in the middle. Holy sh*t, this game gives me crazy anxiety. Love it. Something I don't quite understand about the control is that if I need to hang off the side of a block in order to survive, the guy will instantly leap to his death with an accidental tap in that direction, but if the game is currently building on top of me, sometimes he responds so slowly as to have me crushed right in the middle of the block as though I'd given no control input at all. It seems consistently inconsistent on this point, sometimes allowing me to move as if in the clear, sometimes not at all. The way this game responds to joystick input is indeed different than most other games. The movement of the little stick figure is actually done with a series of micro-animations; that's why the animation looks so fluid. As soon as such a micro-animation has been started (e.g. a single 'step' animation) it can not be stopped halfway; it needs to be fully executed before the joystick is polled again. I think this is where you sometimes perceive a bit of 'lag' in the controls. For some micro-animations it makes sense that you cannot stop them halfway. For example in a jump animation or a single run-step animation, the stick man is actually not touching the ground anymore at some point. It wouldn't make sense to be able to stop a long wall-jump halfway in mid-air, right? But for other micro-animations, like climbing up or down a ledge, it probably makes sense to be able to 'stop and revert' the animation. For example: if you're climbing up a ledge, and halfway the animation change your mind and want to climb down again, ideally you should be able to do this. 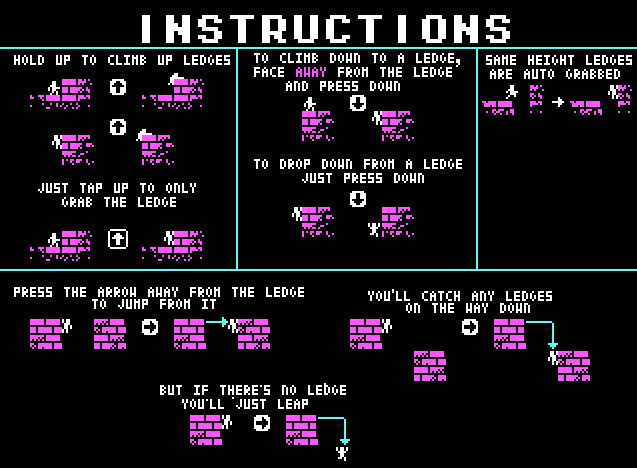 While the controls in the original PC game also have this exact same 'lag', I might be able to fix something to get better control over climbing up or down ledges. Edited by Dionoid, Wed Mar 27, 2019 5:46 AM. I'm sure that you're right. I must be occasionally trying to change directions at exactly the wrong time. FYI: Fluxit has sent me a PM explaining the situation(s) where the controls behave different than expected. It turns out to be caused by playing with a joystick and sometimes using the diagonal directions (instead of just left, right, up or down). As I mostly test on Stella with my keyboard, I never noticed this. I just added a new version of ToR to the original post, which supports diagonal joystick positions. I think this will make the controls better and more intuitive when playing with a 8-way joystick. Thanks to fluxit for the feedback and testing.